Please note that the content of this book primarily consists of articles available from Wikipedia or other free sources online. Get a glimpse at the life of actor, Zach Gilford. Read about his humble debut and the roles that propelled him to stardom such as Post Grad, Dare, The River Why, and more. Please note that the content of this book primarily consists of articles available from Wikipedia or other free sources online. 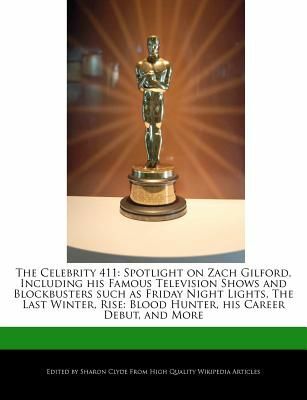 Get a glimpse at the life of actor, Zach Gilford. Read about his humble debut and the roles that propelled him to stardom such as Post Grad, Dare, The River Why, and more. Whether you are a true fan or just want to know more about the star, you will find this book comprehensive and perfect for your needs. Project Webster represents a new publishing paradigm, allowing disparate content sources to be curated into cohesive, relevant, and informative books. To date, this content has been curated from Wikipedia articles and images under Creative Commons licensing, although as Project Webster continues to increase in scope and dimension, more licensed and public domain content is being added. We believe books such as this represent a new and exciting lexicon in the sharing of human knowledge.